WEARCOAT 66 is a solvent based cyclo-aliphatic urethane based coating. It produces a tough, glossy, hard-wearing and chemically resistant surface for the protection of urethane and polyester composites, concrete, masonry, and over approved substrates. WEARCOAT 66 is available as a transparent, glossy coating or as a pigmented material that possesses excellent color fastness and ultra-violet radiation resistance as well as high tensile strength. 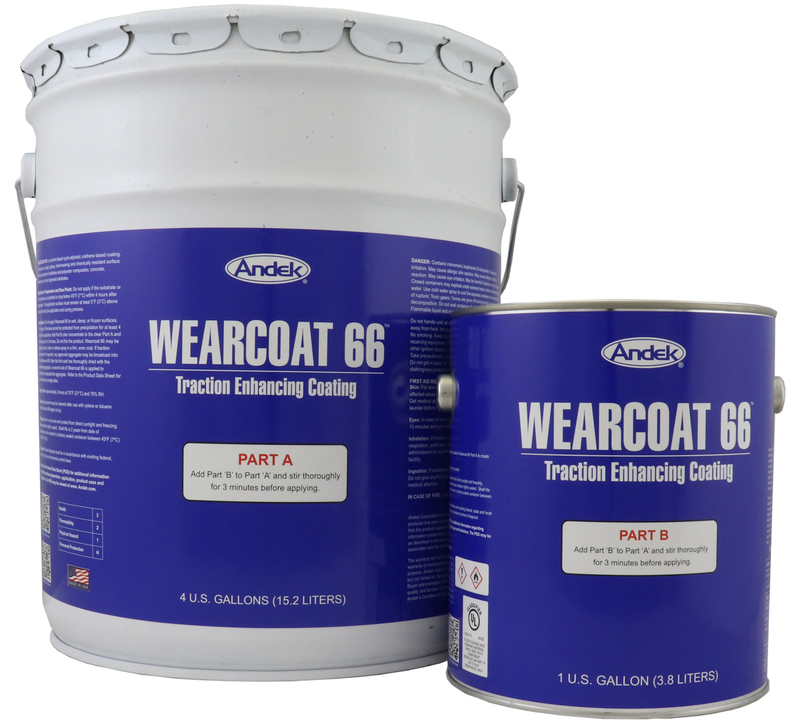 WEARCOAT 66 will encapsulate most aggregates, including sharp, angular types used for traction enhancement. Protects the surface of waterproof membranes over parking structures plazas, balconies and walkways. Provides a durable finish coating inside fountains, ponds, tanks and water features. 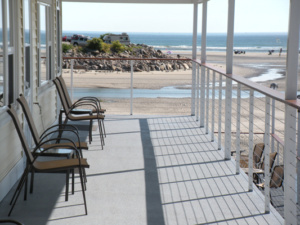 Produces a waterproof, traction-enhanced coating on stairways and access ramps. 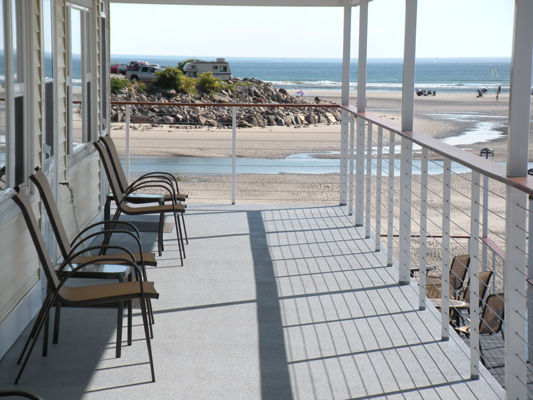 Forms a protective colorfast finish over polyurea, polyester, PVC and composite decks. All surfaces to be coated must be clean, dry, and completely free of loose particles, oil, grease, or any substance that would interfere with proper bond. If overcoating a painted surface, check compatibility first, as some paints may bleed color or be lifted by solvents. Add Part ‘B’ color concentrate to the clear Part ‘A’ and stir thoroughly for 3 minutes. WEARCOAT 66 is applied at a rate of 400 square feet per gallon per coat. 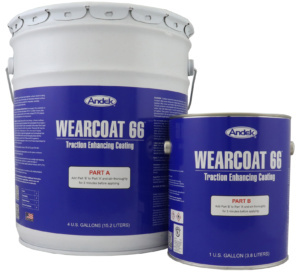 WEARCOAT 66 may be applied by brush, roller, or airless spray technique in a thin, even coat. If traction enhancement is required, the use of vulcanized synthetic rubber granules are recommended. SoftSand Rubber from SoftPoint Industries is available in one-pint or 5-gallon containers from Andek Corporation. Available in several textures (see SoftSand Rubber data sheet), it is applied at a rate of 1 to 2 pints per 100 square feet. Broadcast or mix-in techniques may be used to achieve various levels of traction enhancement. After the first coat has thoroughly dried with the embedded aggregate, a second coat of WEARCOAT 66 is applied to thoroughly encapsulate the aggregate. Equipment may be cleaned with toluene or xylene while the WEARCOAT 66 is still wet. Store in a cool, dry place away from direct sunlight. Avoid opened containers, as moisture will cure the material. Do not apply in temperatures below 35°F. Application must be protected from precipitation for at least 4 hours. Shelf life is 12 months when stored in proprietary sealed containers between 45°F and 85°F.